Mark Daniel, who has been with the city for eight years, started the Police Department's K-9 program. (This article has been updated to reflect comments from Mark Daniel and to note he's now been sworn in at the Mount Angel Police Department. )Sherwood Police Capt. Mark Daniel was recently sworn in as the new chief at the Mount Angel Police Department. Daniel, 52, assumed his duties at the city — best known as the homes of the annual Oktoberfest and Mount Angel Abbey — after being sworn in on Dec. 4. Following the announcement he'd be leaving Sherwood at the Nov. 21 Sherwood City Council meeting, Sherwood Police Chief Jeff Groth said Daniel has been a tremendous resource for the department during his more than eight years with the city. "He brought a level of knowledge and expertise at the right time and he really helped solidify a lot of our processes and programs," said Groth. "He'll be hard to replace." Daniel will oversee a department of five officers and a sergeant in a city with a population of 3,400 residents run by a seven-member city council. He replaces Chief Mike Healy, who retired. Among the things Daniel pushed for during his tenure in Sherwood was an emphasis on community policing, something he believes has proved itself to be a success. "There are many things I will miss about Sherwood," Daniel said right before leaving. "One of the biggest is the people that I have had the great fortune to work with, serving side by side, with true servant hearts, professional in the way the conduct themselves and provide service, who want nothing more than to make Sherwood a safe place to live, work and play!" In addition to its residents, Daniel said he'll miss the community spirit reflected in such events an festivals as the Robin Hood Festival, the Winter Festival and Tree Lighting, the Onion Festival and Cruisin' Sherwood, events that he regularly helped coordinate security and logistics for. Heavily involved in those events, Daniel even acted as something of an unofficial bodyguard during Carnie Wilson's grand opening of her Love Bites bakery in Sherwood last summer. "This community and experiences I have had in Sherwood have made me a better person, and a better police officer, which has prepared me in many ways to take this next step in my life and career," Daniel said. 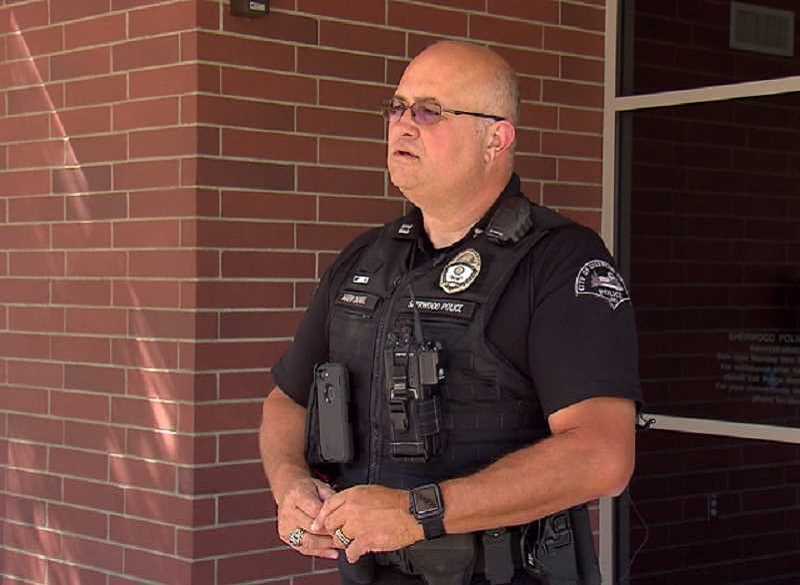 Prior to Sherwood, Daniel worked for the Salem Police Department and the Port of Portland Police, where he was in charge of canine units for both of those departments. He began the canine program in Sherwood. In addition to serving as the police department's public information officer for the last two years, Daniel graduated from the FBI National Academy in Quantico, Va., in 2014. Daniel began his law enforcement career in 1981, working as a cadet for the Clackamas County Sheriff's Department and holds an associate degree from Clackamas Community College. In addition, he has a master's degree in management and organizational leadership from Warner Pacific College and a bachelor's in business administration from Western Baptist. "We'll definitely miss you but we sure wish you well and thank you hundreds of times for what you have done (in Sherwood)," said Lee Weislogel, interim mayor, during the council meeting. Councilor Jennifer Kuiper concurred, saying, "It's going to be Mount Angel's gain and Sherwood's loss." Linda Henderson, a former member of the Sherwood City Council who has worked closely with Daniel over the years, called him "a great confidant." While sad to see him leave, she said she's excited he has the opportunity to be chief. "He has a very hands-on management style," she said. Henderson noted that despite the fact that Mount Angel is down by an officer, she could easily see Daniel going out on patrol to help cover the vacant shift until a replacement is found. Henderson said Daniel once volunteered to fill in for an officer scheduled for duty on Christmas Eve. "He took that shift so an officer with young children could be with his family," she said, noting she believes he's an overachiever, something she considers as a complimentory. In addition to being a volunteer firefighter and emergency medical technician for the St. Paul Fire District, he was also Sherwood's core emergency management coordinator. Last summer, he went up to the Eagle Crest Fire to help put together a management plan when fire devastated that area. "He's constantly challenging himself to be that well-rounded person," Henderson pointed out. Meanwhile, Chief Groth and other Sherwood officers, as well as well-wishers, showed up to Daniel's Dec. 4 swearing in by Mount Angel Mayor Andrew Otte. The Woodburn Independent, a sister publication to the Sherwood Gazette, provided additional background for this article.